The forests of Western North Carolina provide many non-timber products. They include plants, parts of plants, and other biological material, as well as fungi, mosses, lichens, herbs, vines, shrubs, and trees. Many different parts of plants are harvested, including roots, tubers, leaves, bark, twigs and branches, fruit, sap and resin, as well as wood. The most important edible forest product in Western North Carolina is ramps, a mainstay of many festivals. The collection of ramps in early spring generates significant revenue for local civic groups. Other culinary products include mushrooms, fiddlehead ferns, black walnuts, blueberries, raspberries, persimmons, and acorns. Floral and horticultural products include grapevines, Galax, azaleas, log mosses, other annual and perennial plants, cones, shrubs, and trees. Medicinal products include American ginseng, false unicorn, black cohosh, bloodroot, and many others. People harvest non-timber forest products for both market and non-market reasons. Before the European settlers entered the mountains, Native Americans traded these products among themselves. Early European settlers gathered the products for subsistence as well as income. Over time, ecological knowledge, built through generations of gathering, tending, using, and trading, has been preserved and shared. As demand for these products increases, it is important to monitor their removal and the impact that harvest has on their long-term viability. Recognizing the need to monitor the consumption of non-timber forest products, the USDA Forest Service has developed a permitting process that sets a unit price for each product and provides guidelines for gatherers, ensuring a sustainable harvest. The USDA Forest Service has tracked the total value of non-timber forest products sold in the Pisgah and Nantahala National Forests since 2005. The total annual value varies, averaging about $73,000 per year, with the highest income producers being Galax, ginseng, rhododendron and laurel, and firewood. Using “value sold” to express non-timber forest products may indicate trends, but the actual dollar amount can be a misleading measure of real value and could trivialize the social benefits of these products. The quantity and value of non-timber forest products collected on private lands is not currently monitored. McLain, Rebecca J. and Eric T. Jones. 2005. Nontimber forest products management on national forests in the United States. Gen. Tech. Rep. PNW-GTR-655. Portland, OR: USDA Forest Service, Pacific Northwest Research Station. 85 p. Accessed from: http://www.fs.fed.us/pnw/pubs/pnw_gtr655.pdf. Remington, D. 2005-2009. 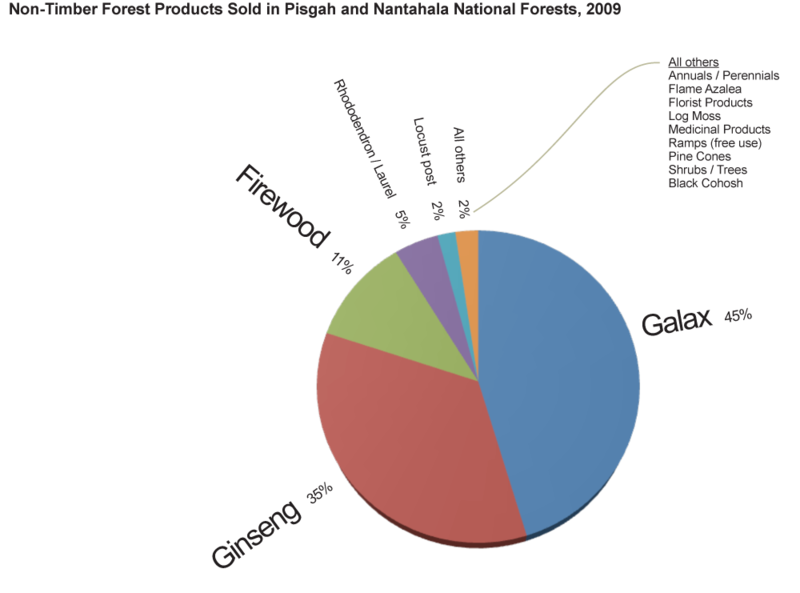 Total value of non-timber products sold in the Pisgah and Nantahala National Forests. Asheville, NC: USDA Forest Service, National Forests in North Carolina. Sallee, Rod, Wayne Owen, Karen Kenna, Gary Kauffman, Marla Emery, Tony Johnson, Phil Araman, Dan Stratton, Greg Reams, Ray Sheffield, Vic Rudis, Susan Loeb, David White, and Jim Chamberlain. 2004. Special Forest Products: A Southern Strategy for Research & Technology Transfer. Science Update SRS-006. USDA Forest Service, Southern Research Station, Southern Region. Accessed from: http://www.treesearch.fs.fed.us/pubs/6276.